710 Genetics - 710 OG. Free US delivery. 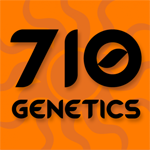 710 OG is the genetic backbone of many of the West Coast of America's cannabis varieties. Its history remains shrouded in mystery. A common myth is that the Chemdawg and a Hindu Kush were the parents of the OG Kush, passing on the distinct “Kush” bud structure and flavour that we see in many OG strains today. 710 OG cannabis seeds take 9 weeks to flower reaching 150-170 cm in height. 710 OG gives off an earthy pine scent with woody undertones and aroma that has become the signature of OG Kush varieties and their offspring.